Name Variation Tena F. Plowman was also known as Jenna. Tena F. Plowman married (?) Howard. Tena F. Plowman was born on 26 February 1923 at Michigan. She was the daughter of Archibald A. Plowman and Manila M. Bumgardner. Tena F. Plowman died on 28 May 1995 at Pasco, Florida, at age 72. [S250] U.S. Federal Census 1930 U.S. Federal Census, by Ancestry.com, ED7. Dwelling 52. Married Name Her married name was McCaffrey. Donia R. Plowman married Robert Lee McCaffrey Sr.
Donia R. Plowman was born on 18 October 1928 at Michigan. Donia R. Plowman died on 30 August 2007 at age 78. Children of Donia R. Plowman and Robert Lee McCaffrey Sr.
Austin Manley Harriger was born on 27 April 1903 at Michigan. He was the son of Manley F. Harriger and Carrie Wickham. Austin Manley Harriger married Mary Rose Hoffman, daughter of Henry Hoffman and Alvina Filsty, before 1925. Austin Manley Harriger married Anne Maria Hoffman, daughter of Henry Hoffman and Alvina Filsty, on 25 September 1937 at Muskegon, Michigan. Austin Manley Harriger obtained US Social Security Card at Michigan; last residence Muskegon, Muskegon, Michigan. [S244] U.S. Federal Census 1910 U.S. Federal Census, by Ancestry.com, ED23. Dwelling 137. [S243] U.S. Federal Census 1920 U.S. Federal Census, by Ancestry.com, ED49. Dwelling 192. Name Variation Anne Maria Hoffman was also known as Mary. Name Variation Anne Maria Hoffman was also known as Anna Marie. Name Variation Anne Maria Hoffman was also known as Anna Maria. Married Name 25 September 1937 As of 25 September 1937,her married name was Harriger. Anne Maria Hoffman was born on 4 September 1909 at Gratiot, Michigan, also reported as 05 Sep 1909. She was the daughter of Henry Hoffman and Alvina Filsty. Anne Maria Hoffman married Austin Manley Harriger, son of Manley F. Harriger and Carrie Wickham, on 25 September 1937 at Muskegon, Michigan. Anne Maria Hoffman died on 5 March 2005 at Glen Lake, Leelanau, Michigan, at age 95 Anna Marie Harriger passed away at Maple Valley Nursing Home on Saturday, March 5, 2005, at the age of 95. She was born Sept. 5, 1909, in Gratiot County, to Henry and Alvina (Filsty) Hoffman. Anna married Austin M. Harriger on Sept. 25, 1937, in Muskegon, and lived most of her life in Muskegon and the Glen Lake area of Leelanau County. She is survived by a daughter, Leah (Bradley) McArthur of Muskegon; two stepsons, Donald (Joan) Harriger and Versal (Charlotte) Harriger, both of Empire; along with nine grandchildren; 10 great-grandchildren; five great-great-grandchildren; and an extended family of nieces and nephews. Anna was preceded in death by her husband, Austin in January of 1993; sister, Mary Olsen; and two brothers, Henry and Charlie. She had attended the Empire United Methodist Church, at which a memorial service will be held on Monday, March 21, 2005, at 1 p.m., with the Rev. Bill Dye officiating. In lieu of flowers, please consider the Empire Volunteer Fire Department or the Empire Heritage Museum. Arrangements have been entrusted to the Covell Funeral Homes of Traverse City. Anne Maria Hoffman obtained US Social Security Card at Michigan; last residence Muskegon, Muskegon, Michigan. [S244] U.S. Federal Census 1910 U.S. Federal Census, by Ancestry.com, ED73. Dwelling 112. Henry Hoffman was born circa 1851 at Germany. He married Alvina Filsty circa 1899. Henry Hoffman died after April 1910. Henry Hoffman immigrated in 1874. Name Variation Manley F. Harriger was also known as Manley T.
Name Variation Manley F. Harriger was also known as Manly. Manley F. Harriger was born on 18 March 1882 at Vicksburg, Kalamazoo, Michigan. He was the son of James L. Harriger and Annette Moyer. Manley F. Harriger married Carrie Wickham, daughter of Thomas Wickham and Catherine M. (? ), on 2 August 1902 at Leland, Leelanau, Michigan. Manley F. Harriger obtained US Social Security Card at Michigan; last residence Muskegon, Muskegon, Michigan. Married Name 1940 As of 1940,her married name was Edsall. Leah Marie Harriger was born on 24 October 1909 at Glen Lake, Michigan. She was the daughter of Manley F. Harriger and Carrie Wickham. Leah Marie Harriger married George Edsall in 1940. Leah Marie Harriger died on 4 September 2004 at age 94 Leah Marie Edsall, 94, of Glen Lake, died Sept. 4, 2004, at Maple Valley Nursing Home. She was born Oct. 24, 1909, at Glen Lake, the daughter of Manley and Carrie (Wickham) Harriger. In 1940, Leah married George Edsall; he preceded her in death July 4, 1964. Leah had been employed at Anaconda Wire and Cable Co. for 43 years, retiring in 1973. She was a member of the Empire United Methodist Church and was a life member of the Daughters of the American Revolution. Chapter 11. She was also a member of the Muskegon Veterans of Foreign Wars in Empire. Gaylord; 11 great-nieces and great-nephews; and a sister-in-law, Anna Harriger of Glen Lake. In addition to her husband, she was preceded in death by three brothers and a sister. Funeral services will be held at 11 a.m. today, Sept. 8, at Empire United Methodist Church, with visitation from 9 a.m. until service time. Memorial contributions may be made to Empire Heritage or the United Methodist Church. Name Variation Orvald Charles Olsen was also known as Orville. Orvald Charles Olsen was born on 21 February 1913 at Port Oneida, Michigan. Orvald Charles Olsen married Mary Rose Hoffman, daughter of Henry Hoffman and Alvina Filsty, on 2 November 1935 at 2nd marriage for her, Leland, Michigan. MAPLE CITY - Orvald Charles Olsen, 85, a lifelong farmer and Maple City resident died Thursday at Leelanau Memorial Health Center in Northport. Born Feb. 21, 1913, in Port Oneida, he was the son of Charles and Hattie (Brammer) Olsen. On Nov. 2, 1935, in Leland, he married Mary Rose Hoffman. Orvald was a member of St. Paul's Lutheran Church in Good Harbor. He was the first school bus driver for the Glen Lake school district in the 1930s. Orvald retired from Peninsula Asphalt Co. as a truck driver. Survivors include three daughters, Carol (Richard) Oosdyke of Greenville, and Lorraine (Edward) Zientek and Barbara (Ernest) Zeigler - both of Maple City; two sons, William (Linda) Olsen and Gerald Olsen - both of Maple City; two stepsons, Donald (Joan) Harriger and Versal (Charlotte) Harriger - both of Empire; two sisters, Lorraine Mason of Empire and Garnet Phillips of Eustis, Fla; 10 grandchildren; and seven great-grandchildren. Orvald was preceded in death by his wife, Mary, on June 3, 1990; four brothers; two sisters; and two grandchildren. Friends may call from 2 to 9 p.m. Sunday at the Martinson Funeral Home in Suttons Bay. Funeral Services will be held at 11 a.m. Monday at St. Paul's Lutheran Church; the Rev. David R. Loeschke will officiate. Burial will be in Cleveland Township Cemetery. Memorials may be directed to the Ladies Aid Society at Paul's Lutheran Church or the Cedar Rescue Squad. Name Variation Steven Harriger was also known as Steve. Steven Harriger was born circa 1906 at Michigan. Married Name 17 April 1917 As of 17 April 1917,her married name was Udelhofen. Theresa C. Langkamp was born on 12 January 1892 at Grant, Wisconsin. She married George Nicholas Udelhofen, son of Gerhart Udelhofen and Mary Emma VanNatta, on 17 April 1917 at Grant, Wisconsin. Theresa C. Langkamp died on 5 March 1976 at age 84 Services for Mrs. George (Theresa) Udelhofen, 81 of Platteville, who died Friday morning at the Parkview Terrace Nursing Home here, will be at 10:30 a.m. Monday at St. Mary's Church here. Burial will be in St. Andrew's Cemetery, Tennyson, Wis. Friends may call after 2 p.m. Sunday at the Mergen Funeral Home, here, where the scripture wake service will be held at 8 p.m. Surviving besides her husband are two sons, Harold of Platteville and Leland of Lancaster, Wis; two daughters, Mrs. Harlyn (Alberta) Wieland of Winthrop, Iowa, and Mrs. Robert (Helen) Smith of Cuba City, Wis., 24 grandchildren and 10 great-grandchildren. Name Variation Jacob Udelhoven was also known as Jake. Jacob Udelhoven was born on 22 April 1882 at Potosi, Grant, Wisconsin. Sophia Udelhoven was born in September 1884 at Potosi, Grant, Wisconsin. [S245] U.S. Federal Census 1900 U.S. Federal Census, by Ancestry.com, ED51. Dwelling 216. Otto Udelhoven was born on 12 February 1887 at Potosi, Grant, Wisconsin. Bertha K. Udelhoven married (?) Turner. Bertha K. Udelhoven was born on 27 February 1890 at Harrison, Grant, Wisconsin. Ida Udelhoven married (?) Mueller. Ida Udelhoven was born in April 1892 at Grant, Wisconsin. John Fargen was born circa 1830 at Ireland also reported as about 1825. John Fargen married Bridget (?) before 1860. John Fargen died on 25 April 1900 at Sauk, Wisconsin, 75y. 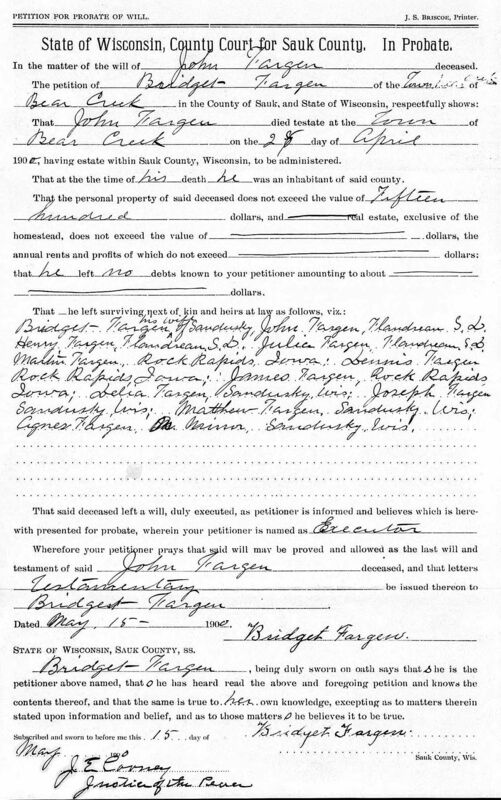 His estate was probated on 3 July 1900 at Sauk, Wisconsin. [S246] U.S. Federal Census 1880 U.S. Federal Census, by Ancestry.com, ED246. Dwelling 80. Married Name before 1860 As of before 1860,her married name was Fargen. Bridget (?) was born in 1842 at Ireland. She married John Fargen, son of Henry Fargen and Bridget (? ), before 1860. Bridget (?) 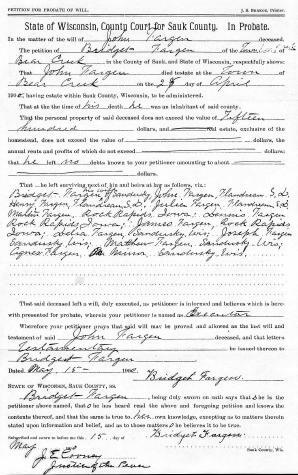 was listed as a beneficiary in John Fargen's will on 3 July 1900 at Sauk, Wisconsin. Bridget (?) died on 1 October 1922 80y. Bridget (?) immigrated in 1855. She had 11 with 10 living in 1900 children. She had 11 with 10 living in 1910 children. [S245] U.S. Federal Census 1900 U.S. Federal Census, by Ancestry.com, ED129. Dwelling 104. [S244] U.S. Federal Census 1910 U.S. Federal Census, by Ancestry.com, ED110. Dwelling 71. Mary Fargen was the daughter of John Fargen and Bridget (?). Mary Fargen died at 18m. Dennis Dorgan was born circa 1844 at Ireland. He was the son of Jeremiah Dorgan and Johanna O'Connell. Dennis Dorgan immigrated with Johanna O'Connell and Jeremiah Dorgan in 1848. [S248] U.S. Federal Census 1860 U.S. Federal Census, by Ancestry.com, Page 62-63. Dwelling 575. Richard Dorgan was born circa 1847 at Ireland. Richard Dorgan immigrated with Johanna O'Connell and Jeremiah Dorgan in 1848. Name Variation Patrick C. Dorgan was also known as P. C.
Patrick C. Dorgan was born in May 1853 at Wisconsin also reported as Pennsylvania. Patrick C. Dorgan married Hannah (?) circa 1895. Patrick C. Dorgan died after 1936. Maria Dorgan was born circa 1851 at New York also reported as Pennsylvania. She was the daughter of Jeremiah Dorgan and Johanna O'Connell. Ellen Dorgan was born circa 1855 at Wisconsin. Married Name Her married name was Brewer. Hannah Dorgan married (?) Brewer. Hannah Dorgan was born circa 1857 at Wisconsin. Hannah Dorgan died after 1936. Name Variation Catherine Dorgan was also known as Katie. Catherine Dorgan was born circa March 1860 at Wisconsin. Bridget Dorgan was born in September 1861 at Wisconsin. Married Name circa 1895 As of circa 1895,her married name was Dorgan. Hannah (?) was born in December 1864 at Wisconsin. She married Patrick C. Dorgan, son of Jeremiah Dorgan and Johanna O'Connell, circa 1895. Hannah Dorgan was born in June 1895 at Wisconsin. Jeremiah Dorgan was born in January 1898 at Wisconsin. He was the son of Patrick C. Dorgan and Hannah (?). Mary Dorgan was born in January 1900 at Bear Creek, Sauk, Wisconsin, twin with Kate.